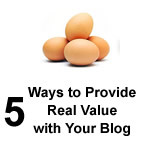 5 Ways to Provide Real Value with Your Blog! →5 Ways to Provide Real Value with Your Blog! Today, we have Zac Johnson here, this time to share with us excellent tips to make our blogs a place to be. Zac is a pro blogger and top affiliate marketer. He’s the found of Blogging.org, a video training platform aimed at out of you a pro money making blogger and affiliate marketer. There are well over 300 million blogs in the world today. That’s a lot of freaking blogs! The bad news is that 99% of them are garbage, consisting of either low quality content, forgotten projects or simply don’t serve a purpose to the rest of the world. So how can you make a blog that actually serves a purpose and can become a legitimate site or even full time business in the process? With that said, here are five great ways to bring more value to your blog and your visitor experience in the process. After all… isn’t that why we are blogging in the first place? With millions of blogs out there already, it’s a sure bet that a lot of blogs are going to be covering the same topic as yours. Instead of trying to replicate what’s already out there, take the time to study your competition and see what’s currently out there. Then use this information to create better, longer and more updated content. If you have the time and work ethic, reach out to other sites in your industry who are linking to older and outdated articles and see if they will replace the link to your content instead. Enstine did a great job with his top 20 bloggers post, as it not only brought meaningful content to his blog, but also brought in a lot of backlinks and shares from the experts he interviewed as well. Text content is what ranks well in the search results, but it doesn’t mean it should be your only source for information and value on your site. Infographics are a powerful way to deliver your message while also getting other sites and visitors to share your content and link back to your site. Everyone loves visuals and there is simply no better way to get your message out there, than with a nice looking infographic. If you are looking for some ideas and inspiration, check out these top wordpress infographics being passed around in the blogging and online marketing space. People are on the internet for three reasons — to buy something, be entertained or find information. If you are going to be creating a blog that you expect to grow in size and make money, then you are going to need to cater to one, if not all of these needs. Creating a blog that is focused on providing the best resources and tools is a great way to find success. We currently see this being done in the blogging and WordPress space, though it is getting heavily saturated. This again leads to the need to provide better content than you competition and getting it out there. Need an example? Check out Enstine’s monthly income reports — he breaks down where and how he is making money online. Great content and a great resource. Building a brand to provide better user experience?… That doesn’t make sense, does it? Sure it does! Think about this… would you rather read an article posted on a site like TechCrunch, Mashable or written by an expert like Guy Kawasaki or Seth Godin… or an article that is posted on some random blog that has no branding, authority or a clear message? Obviously your time is valuable and you don’t want to waste it reading what could be potentially ‘unreliable’ content on an unknown site. Even though his blog is still fairly new in the online marketing and branding world, Enstine has done a great job with this as well. With an active social following, great comments and engagement throughout the blog and the additional of a custom logo / cartoon design of Enstine in the header… it’s a current reminder of who he is and where you are when you are reading content on this blog. This is why you NEED to establish yourself as an expert within your niche and create an awareness and brand or your blog to help it grow as a trusted source for information over time. Finally, you need to have a call for action. One of the best ways to add value to your blog experience, is to walk the user through a process so they can take action right away and improve their life, business or why ever they are on your site in the first place. For example, this is what I have done through my create a blog tutorial. This massive and detailed free content walks a user through the most basic phases of how to launch a blog. In short, it gives even the most non-tech savvy site visitor all the information they need, different alternatives and sends them off in the right direction for them to get started. Don’t just write content. Create content that has a beginning, a problem and a solution. As mentioned earlier, with millions of blogs in the world today, this is a game of branding and providing the best value to your audience. Your blog only has one chance to make a great first impression and one of the best ways to do this is by standing out from the crowd. Take some time to visit your blog and read through your content as if you were a site visitor. Does it address a situation, provide value and give the reader what they want? If not… you have some work to do! Thanks for reading. Let me hear your thoughts in the comment box. Please remember to share this post on social media. Thanks for submitting such an awesome post to my blog. I’m so excited about it. I’m sure my readers will appreciate your stopping by and the value in this post. Always a pleasure, thanks for posting the article. I’ll be sure to share it around to my followers and answer any questions/comments that show up here as well. Welcome to Enstine blog, he feature here some of the best and awesome bloggers in front of us through which we can learn more about others and can grow. As You said providing better content than competitor is the thing one need to deliver now a days to achieve better ranking in search engine. While Infographics helps in getting backlinks from various sites. Thanks for the comment. Glad to take part in it while also expanding my reach and expertise in the process 🙂 It’s been great to engage with all of the readers on this site. Welcome to Enstine,s blog. Your visit is much appreciated by me. It has been a great deal for me to map out time to read this post the way I wanted. It has been long I visited enstine,s blog, though I was and still busy tackling some offline jobs. Wish to be active in a couple of days to come. You gifted us the best; I couldn’t turn off this post till I reach to the end word. You did it like a warrior. With a righteous anger, you spoke out authoritatively! I’ve grabbed that trait from you. Just really excited with your first point; create better content among your competitors! What a great information. Actually, you’re on my side. You supports the phrase, “Content is King”. Am working on something better to expose how important is it to have a great content on a blog. Great content is not all about millions or words or images, great content is not about too many shares and comments, great content is not all about the author’s name in the industry; its all about serving the purpose of creation, solving problem and setting a standard(standing the taste of time). You’re highly welcome Zac. Best wishes to you and the entire community of ZacJohnson(.)Com! Do have a nice week ahead, my good friend. Thanks for featuring Zac! Great post. Lot of gold nuggets in there. Enstine you have done a great job at growing your blog very quickly, you have a huge following! I think the branding part is spot on. I have seen my very new blog grow very quickly and I think it is because of the branding work I have done. People generally think it is a lot older than just 3 months! Hey Chris, thanks for the comment and reading the post. Branding is definitely key! No matter your niche or topic, you want to stand out from the crowd and establish yourself as an authority as soon as possible. Hi Zac and Enstine, it always amazes me to see how many bloggers are out there and how many other blogs exist. We really have to be unique to stand out from the crowd. I really like your #1 tip to reach to other sites in the industry who point to older articles, great idea. Having a call to action is something I have been working on, mine is the eBook I have written with Twitter tips. I give it away for people to subscribe to my blog and I recently added a pop up (Something I haven’t been a fan of) but I aleady got new 2 subscribers within the first few hours of installing it. I had been reading how much they work and I see several here at Enstine’s place. Thanks for sharing these tips and enjoy your day ahead. Hey Lisa, thanks for stopping by. The gateway entry to blogging is limitless and free… which is why there are 300+ million blogs in the world today! This number is going to keep growing year and year… while also making it harder for the best bloggers to stand out — however, this does bring in more opportunity to expand your reach and expertise as well. Awesome work on the Twitter ebook. Grow your following and become the go to expert for Twitter (huge industry!). There is no way Zac will show his face and go without leaving something filled with awesomeness. I love that tip #1 too. It’s an incredible way to stand out and make a difference. Very pleased to see you at Enstine’s place, truly happy! You got me with it! Seriously, we all have to and must blog for problem-solving content. It our content is not backed with such mindset, we are not writing for anyone and our content won’t serve anything like you said any purpose. Content is the best medium to shine in your brand but poor English writing skills and frequent grammatical errors can kill all of its shine, right? Truly an awesome post from you, Zac! Happy to share it! As you said, writing will only get you so far. Content is best laid out when it addresses a situation, describes how to fix it and gives a solution. After all, this is what the majority of site traffic is looking for anyway. Instead of writing “5 Ways to Make Money Online”, writing “5 Steps to Make Money Right Now” would be more effective and get people to take immediate action on your site. A lot of people don’t support grammatical errors. For the most part, it’s hard for International bloggers to write without errors. All we should do is try to keep them as less as possible. Mr. Enstine did a great job bringing you over here. I’m glad to read this post. The “300 million” figure for blogs got me thinking. I have always known that the blogging world is full of competition but that figure just gave me a clearer image. Blogging is real business. Without a good strategy for the target audience, every effort will just be futile. Thanks for sharing. I will constantly improve on various sections you highlighted. Thanks for stopping by Ologundudu, always good to see another fellow blogger. With hundreds of millions of blogs in the world today, there is definitely a lot of traffic, attention and money to be made. Cater to a huge enough audience and you only need the smallest percentage to make a big difference (or money). Your Post, not really that long words but it worth sharing and to Re-read every morning before making a new Blog Post/Project. For Infographics, I’m not really good at Graphic design but I’m planning on how to Improve on it . BTW, i love the story you tell within a means of an hour . . And will surely keep checking on you for more advance Blog tips. Thanks for the engagement on Zac’s post. He’s a figure no wan does not know because of his works in blogging and affiliate marketing. Hey John, thanks for checking out BloggingTips.com and my other sites/articles! For infographics, check out piktochart.com and fiverr.com. Piktochart is super easy to use. Be careful on Fiverr, as some designers aren’t what they say they are — but it’s another good resource. Thanks for inviting Zac on your Blog. He is sure a man of his work. It was really nice to read from you. You shared some really great points. Such as there are tons of Blogs but most of them are just box of trash. Actually stepping into Blogging is just like stepping on to flowers but once you spend some time, you start feeling the thorns beneath. One great blogger said once, Blogging is just like building muscles. Both take time and consistency. However I had a question in my mind. What is the maximum time gap that I can put between my Blog Posts? Can I do like publishing one Blogpost after 10 days? Or it is too much time gap? Zac will surely be here to answer your question. Stay tuned! Enstine Muki recently posted…SeedingUp ~ Sponsored Posts for your blog and Social Media profiles! Scheduling and content size is totally up to you. I don’t have a set schedule… I always wanted to try and “blog daily”, but it ends up being too much work and I don’t want to push content out there just for the sake of putting something out. The best way to create content and figure out a schedule is to look and your blog and figure out a need. If you have an informational/resource blog, you don’t need to blog often. Also, focus on writing BIG and detailed posts versus smaller ones. This will help with social, seo and viral sharing. 2,000+ word articles are now all the hype! I like your visitation to Enstine’s blog; you’re welcome. Thanks revealing this great information to us. You did it best. Providing real values to our blog readers is the priority of any blogger. That’s it; content is great. Thanks for showing in, do have a nice day! Zac is the man isn’t he? It’s exciting to have him here to share such great content and revelations with us. Thanks for taking the time to engage with him. He will surely be here to respond to your comment too. Enstine Muki recently posted…Hostgator coupons ~ Evergreen Hostgator Vouchers! For anyone who is focused on writing one 500 word post daily to their blog, step back for a moment and plan out a 2,000 word post once a week instead. See how much of a difference it might make in your social, viral and search traffic. Hi enstine thanks for inviting Zac here on your blog and it really great to have you here Zac. This is a great post and what to really put in mind in this blogging game. Indeed having an infographic post on one’s blog is a great idea as everyone loves visual and it makes readers to come back for more. Thanks for the comment. Infographics are awesome. I’m actually working on a case study now and building out my own infographic resource site. Lots of opportunities here! Einstein: Thanks for having Zac here, tremendous value given. Zac: I couldn’t agree more with all of the tips you shared and resonate with the five ways you outline to give value when you blog. It’s a challenge, but I’m constantly trying to think outside the box with regards to being creative while delivering content on my site. That’s a great point. I never thought about reaching out to those who are sharing in order to have my links updated, Thanks for that suggestion. Just recently I started implementing infographic posts, and really enjoy providing content in this Rich media format. We can definitely rank for images as well and should be providing unique and original images which are only on our site. I love your number five, have a call to action. Most definitely! I agree that we should have a call to action in every blog post, that’s easy to understand and to the point. Absolutely agree that the value of our blog is reflected back on us. Most definitely, and I’m glad that I started from day one keeping this in mind. I’ve learned some new things here, so thank you for that. I hope you two have a lovely evening, and I’ll be talking with you soon. Thanks for reading and the indepth comment! It’s definitely worth your time to create awesome content that includes authority figures, resources and references. This way you can continually reach out to those that were mentioned and see how they promote you as well. For example, whenever I am interviewed on another blog or someone does a write up on my site — in most cases I will grab that article and schedule it into my Twitter feed, which then goes out to 50,000 every few days or weeks. Thanks Enstine and Zac for bringing this together, great tips. Like you were talking about, if you want visitors and leads, pick a conversation you want to own in your niche and simply create content better than everyone else in it. Not only will it be shared, but rank in sites like Google not because of some SEO backlink trick, but because it’s actually worth being top ranking content. Definitely. The easiest and most effective way to create a profitable blog is to solve a problem… not create content that has already been talked about a million times in the past. Hello Zac, it’s good to see you here at Enstine’s blog I always loved your blog updates about the affiliate marketing but I was not aware about your initiative Blogging.Org thanks for sharing such an informative article to help me and others who are growing slowly to become a better blogger in near future. Thanks for being a long time ZacJohnson.com reader. I recently launched Blogging.org as a paid coaching membership site, but also wanted to make sure it provided value to those who didn’t have the necessary funds to get started. It’s a fun work in progress and lots of exciting things are in the works! Whoa am speechless , Enstine Muki you are truly doing great on this your platform for having the privilege of Zac Joshson, guest blogging on your blog a big ” Thump Up” for you. Zac thanks for detail informative post like this and am big fan of building a brand and show that you an expertise in that arena. Thanks, appreciate it. Me and Muki have been sending emails back and forth now for a while and it made for a good opportunity for the both of us. Thanks for reading! Infographics is best way to attract more visitors.. Thanks for the comment. Looks like a lot of people are interested in the infographics concept. I might do a follow up post in a month or two on infographics is everyone is interested. This was a great lesson to provide real value to audience. Lately I’ve practicing #1 by using tools like Buzzsumo to see what my “competition” is doing and figuring out how I can improve what they wrote. It has worked quite well, but I know I can do better. Also I’ve been improving my call to action via my opt in forms. I’m always testing my copy to see if it’s comprehensive, concise, and piques interest. I tell you, I still need some work to do LOL, but I have been getting subscribers every week at least! Thanks for the share and I hope you two have a great week! Great and helpful tips .It really very easy to understand your tips.You have done justice with this post and really found this article interesting to read.I ma happy to visit your post again and again will surely follow you . I have a question for you… I like the point about infographics. I am planning to create a few of my own in the near future. Historically, I have hired a graphic designer to create infographics for me, which can get expensive. Do you know of any online services that can make high quality infographics at a lower price? Would love to hear any recommendations you might have. Thanks, and great post! Wow, Enstine you are my number one influencer,talk of blogging. Thanks !! I would also want to here or know more about the free Payoneer card you once mentioned.Thanks once again. Thanks for sharing…! The above is really nice tips to add value to our business. Actually, I love what you said “providing better content then our competitors”. Absolutely, right..? Users went online because the want to find better content…I agree Enstine has done a great for building better content. I have read some those 20 posts, and I found that it is really awesome post. What more right you mentioned above is that “focus on building brand”. Sure, it is the most important facts to build online success. Of course, Enstine has done the right again, since I found he was very active on both social media networking and build community. I always Enstine’s guest posts on so many pro bloggers.